By Peter Frank, General Secretary, ScanBalt; Daan Bultje, Vice Chairman of ScanBalt, Director, Healthy Aging Networks Northern Netherlands; Jaanus Pikani, Chairman of ScanBalt, Entrepreneur, Chairman of the Board, Tartu Biotechnology Park. Let’s say goodbye to stereotypes, presuming that entrepreneurship is only for young people while elderly are inactive and/or less creative. This is the age of the CreAgers, tapping in to an undervalued source for innovations, ideas and start-up companies. For too long, the ageing population has been framed as a financial burden on society, putting a distance between generations while solidarity and intergenerational interaction are essential for our future. We have to take better into account the growing importance of elderly both as consumers, as a market for new technological solutions and – not least – as sources for new innovations and economic growth. The public perception of being elderly must be changed from solely as someone who has to be taken care of for the costs of society into a group of influential persons with resources to affect our future and create gains for our present. With increasing living standards and the growth of expected healthy life years the new reality predicts that former forties is today’s sixties. In fact: We have the arrival of the CreAgers, the new creative class of elderly, who starts businesses, who assist as advisors for others or who in other ways are or desire to be active within innovation and entrepreneurship. At the end of 2014, the Dutch government turned to former EU commissioner Neelie Kroes – 73 years of age at the time – to strengthen the international position of startups in the Netherlands. ‘Her extensive experience and personality make her the ideal person to pursue and support this international ambition’ the Dutch minister of Economic Affairs explained. As Special Envoy, Kroes spent 18 months providing ‘(…) a new generation of startups the opportunity to develop their talent, to innovate and to create jobs in the Netherlands’ to use her own words. It worked out great. The – mostly young – entrepreneurs fully profited from the experience and exposure of Neelie Kroes. Unfortunately, the idea that elderly entrepreneurs are an underrepresented group in the Start-up community, while the potential is unmistakable, was never really addressed. In Denmark in the period 2004 to 2012 there was an increase of 33 % of 60 – 64 years old who established start-ups. In the group of 65 – 69 years old the increase was 67 %. More than 61.000 over 60 years of age were self-employed in 2013. But these numbers cover the fact that many highly skilled elderly, like engineers, are released from their positions despite their qualifications and therefore choose to work for themselves. So it appears, that on one hand there is an increasing willingness and desire for elderly to establish own companies while a second group is composed of those who are doing so because they are not welcome on the labor market due to their age – or rather – due to the public perception of what age means. These tendencies are certainly not unique to Denmark given here as an example but can be found widespread in the EU countries or even globally. CreAgers form an innovation-loop: knowing people’s needs, turning this into concepts, products, businesses and using the user experiences to adjust or develop new concepts, etc. We should therefore strongly consider how to give the CreAgers the best working conditions. This would be a huge benefit for the individual CreAger and for society as such. However, despite that elderly harbor a huge potential for innovation they suffer from the disregard by society, the lack of focus on CreAgers and even bureaucratic rules which may punish CreAgers for wanting to earn their own income or supplement their pensions. The public perception and policies thus have to be targeted. Part of the solution may be the establishment of local or regional CreAger hubs. 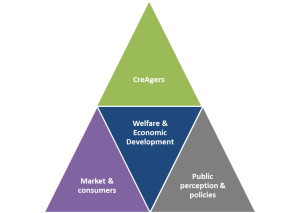 In particular we propose that the triangle between CreAgers, elderly as a market for new technologies and as consumers and the communication dealing with the public perception and the policies should be inter-linked. A CreAger Hub may ensure an efficient working level coordination and concrete results can be measured to document the effect and justify the investments. Additionally cities and regions can brand themselves as being CreAger friendly, having an attractive CreAger environment, which again may influence on the decision of where resourceful elderly decide to live. As indicated concrete activities may for example focus on (1) elderly as inspirators and entrepreneurs; (2) new services and new technologies targeting welfare for elderly; (3) changing the public perception of elderly and promote better conditions for CreAgers. Many well proven concepts are already available which can easily be adopted to serve the local hubs and new ones may be developed when necessary. There also exist efforts directed towards elderly and creativity but these are scattered and mostly not contained within an overall strategic view on the importance of CreAgers. The CreAger hubs may again be interconnected in a wider network as this can assist to e.g. learn from best practices, enhance market access for CreAgers, influence national or EU policies and attract external funding and private investments. And the oter way round, an international CreAger network may assist to establish regional or local hubs. CreAger may even be a global network and initial discussions have in fact revealed significant interest in e.g. India and the US. It would be truly exiting if so many countries and cultures could be brought together as this may create a learning environment with a high critical mass. Finally, CreAgers should be a topic of inter-disciplinary research between e.g. innovation research, gerontology, and socio-economic research to provide deeper knowledge about the CreAgers. This would be a very good investment for society as it may assist to provide solutions and policy recommendations. Welcome to the CreAgers – Time is on their side.